Dr. Mayuri P. Sadhwani, Gujarat, has won the lucky draw for this month. She is awarded with a stethoscope and an appreciation certificate. Dr. Sanjaykumar G. Patil, Maharashtra has been selected as lucky runner to receive an Excellence Certificate for this month diagnostic quiz. A twenty two years old male consulted for low backache since six moths. Pain and stiffness was more in the morning and after of inactivity. His blood studies reported as HLA -B27 antigen positive. 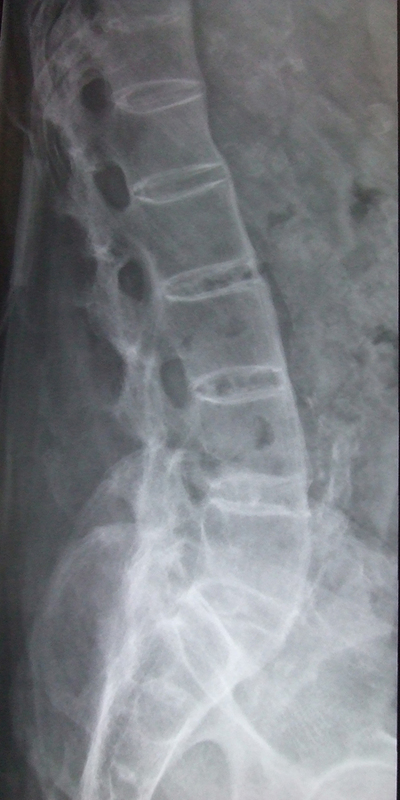 A X ray lateral view of the spine given here for your radiological impression? A fifty eight years old retired Thasildhar who keeps busy always, went to Kodaikannal, developed violent palpitation and breathlessness following tinnitus with vertigo. Last night he had consumed whiskey and chewed tobacco. His blood pressure was normal . A homoeopath nearby gave a drug which relieved his complaints.